Spine 3.6 is now available! Blog: Spine 3.6 - Tint black, clipping, weight painting, and more! Can't wait for the devs to say the new runtimes aren't causing issues in our game to start using it! 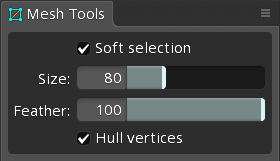 Here's a pro tip: you can ctrl + alt + click to remove a soft selected vertex from the soft selection. Note if you then select a new vertex, soft selection will be applied again. 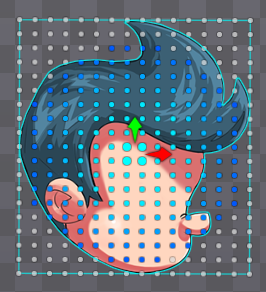 I've only been animating with preview active for the short time it's been there. 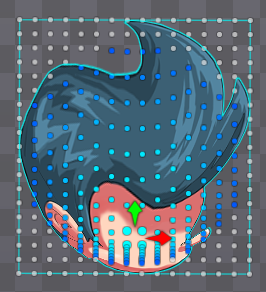 It's a lot of fun tweaking animations with it running. You instantly see all the small nuances of the animation if it's playing while you're editing. i'm curious about the lighting on the tint black section on the tank. How do you achieve that partial illumination on the side of the tank? is it just the glow from the explosion or is there a way yo light up a clipped section of the sprite? Maybe it's something that has no connection to the actual update, i'm sorry if it's off topic. I'm an artist. Check @nempatriarch on tumblr and instagram. 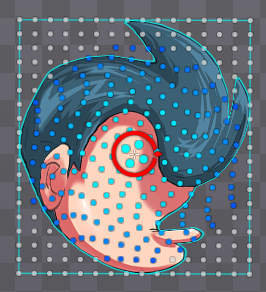 Clipping can get expensive, so it's best to clip as few vertices and attachments as possible. Be sure to test CPU usage for what you are doing at runtime before going too crazy with it. 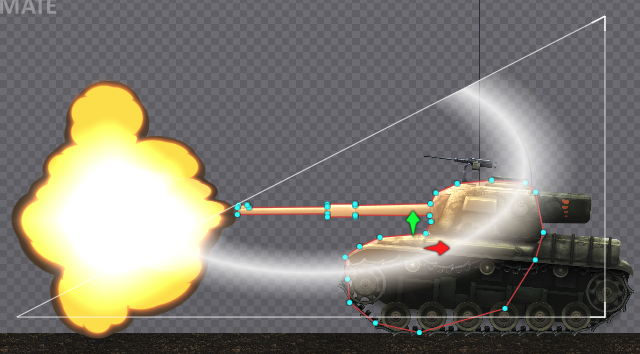 While the tank and the new coin example use clipping for lighting effects, that is not its only usage. Eg, the spineboy portal. Nempatriarch a écrit: i'm curious about the lighting on the tint black section on the tank. 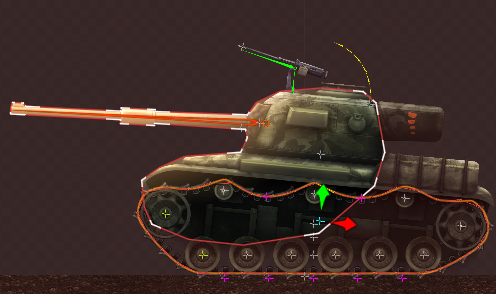 How do you achieve that partial illumination on the side of the tank? is it just the glow from the explosion or is there a way yo light up a clipped section of the sprite? an attachment set to Additive blending. Another example of this effect is used in the Coin example that comes with the latest launcher. Thanks! yeah i see now. I guess it would be messy to do it in a humanoid character in plain motion. I'm really looking forward to audio support! Is there a way to be notified when the beta is out? Impressed as always at the features you are packing into Spine. I'd just like to say that all the editor updates are awesome of course, but I appreciate the attention you also are giving to improving the runtimes and the repos. Your previous move to keeping the runtimes in pace with latest editor release features was huge, and now moving to versioned branches for the repo is another big improvement. So thanks for the awesome work. Any thoughts on separating the individual runtimes into their own git repos? For one, reading the commit history would be a lot more useful, as it would not be interspersed with other platforms I'm not using. Would also make importing just what I need as a git submodule for example a lot easier. I'm considering moving the runtimes to individual git repositories and making them submodules of the main repository. It's a bit complex to unwind the example projects, but it's on my "will look into this option asap". FWIW, every runtimes specific commit is prefixed with `[runtimename]` so you can filter the logs more easily. Submodules would be convenient for users to pull in the Spine Runtimes, but quite inconvenient for runtime development. Git submodules are a bit of a half-baked Git feature (look, a haiku. uhhh I hate mornings). I would much rather Git implements a better solution to the problem of pulling in part of a repo without causing the repo maintainers grief. Hi I am new to the forum and have been using Spine for just a few months. I just updated my Software today and started working on a file i made from the previous version. it worked but after saving the file and closing the program, when I started it up again, I am getting this error message. "Sorry, an error occurred while reading the project file. What was the previous version you were using? Spine saves backups every 15 minutes in the backup folder so if you're lucky you might find a very old version, try matching the editor with that version by downgrading it, and then go on working. @Dmitriy Makeyev That's the same issue here! Spine 3.36 Error?? Should be fixed on the current one. Script 'Animation' has the same name as built-in Unity component. AddComponent and GetComponent will not work with this script. That should be fixed now. Latest unitypackage dated today. The first warning is harmless. But Unity Tech said they won't remove it.